Healthy Paws Pet Insurance & Foundation is one of the world’s premier pet insurance agencies and promises to protect your cat or dog against almost every conceivable threat. But is the Healthy Paws pet insurance plan worth the $30 average monthly fee? That’s what we’re here to find out. In this article, we’re going to be discussing the pros and cons of a Healthy Paws pet insurance policy, as well as examining the reviews and testimonials of long-time Healthy Paws customers. A lot of pet owners avoid taking out any sort of pet insurance policy. They view it as just another expense, one that might never even pay off. But is pet insurance really as unnecessary as some people like to think it is? According to statistics gathered by the American Veterinary Medical Association, more than 50% of cat owners in the United States take one or more of their cats to a vet every year. 21.5% of cat owners who avoid making veterinary visits have admitted that they just don’t have the money to do so. On the canine side of things, the AVMA found that only 18.7% of dog owners do not make a trip to a vet in the average year. Almost 30% of that 18.7% cite financial instability as the reason they don’t have their dogs examined on a regular basis. If each of those cash-strapped pet owners were to secure pet insurance, they wouldn’t have to avoid making veterinary visits with such determination. The average cost of a trip to the vet in the United States of America is $55, and that’s just for a consultation. If surgery and medication are needed, you can expect your bill to go into the hundreds, maybe even the thousands of dollars. A quality pet insurance plan will cover the bulk of any vet’s bill, so you won’t face financial wipeout should your pet develop a tumor (an estimated 12 million cats and dogs are diagnosed with cancer every year). Whether or not Healthy Paws Pet Insurance & Foundation is the best pet insurance agency in the world ultimately comes down to a matter of opinion, but it’s certainly the most decorated. 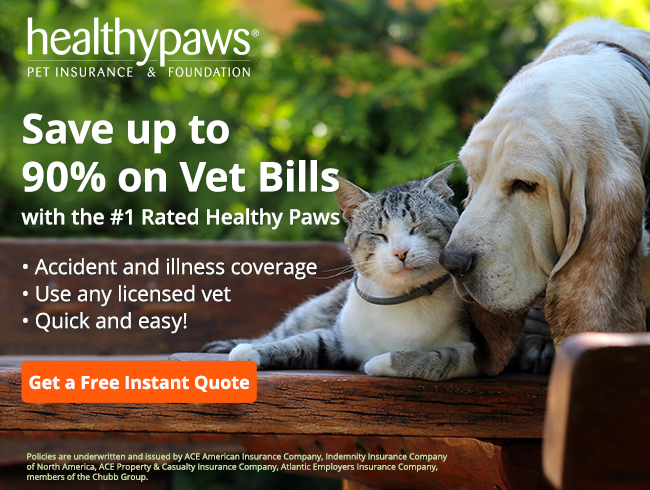 Healthy Paws was listed as the top-rated pet insurance company in the United States in 2015, 2016, and 2017 and looks to be on track to securing the same honor again in 2018. According to one very satisfied customer, Healthy Paws goes above and beyond the call of duty. Not only did the agency pay for the care the customer’s pet required after coming down with a severe case of pneumonia, but a representative called after the treatment had been completed just to ask how the pet was healing up. That is a level of dedication to policyholders that you just can’t get—or even expect—from most other pet insurance agencies. When his cat fell from the window of his apartment, one doting pet owner was left with a vet’s bill of near biblical proportions. Thanks to his policy with Healthy Paws, however, he was able to secure the best possible treatment for his feline friend without having to give a second thought to the ever-increasing invoice. Less than two weeks after his cat’s discharge, Healthy Paws reimbursed this particular policyholder for the cost of a series of surgeries, as well as for a week of convalescence and postoperative care. In October 2017, a time when pet injuries traditionally increase, one satisfied Healthy Paws policyholder took to the internet to echo the sentiments of those aforementioned awards and accolades. “We could count on it in the early days,” he said of Healthy Paws and its insurance plan, “and are thankful to have it now as we move into the senior years.” According to him, Healthy Paws, after years of covering his dog’s medical bills, had no problem doing so once again when the aging canine needed a last-minute surgery. On average, a spaying or neutering surgery will set you back $150. Healthy Paws refuses to cover such procedures as they are not seen as essential to an animal’s well-being. Although your dog will receive lifetime coverage once you take your policy out, Healthy Paws will not enroll a dog if it is over 14 years of age at the time an application is submitted. Healthy Paws Pet Insurance & Foundation is the rarest of beasts. A pet insurance agency that cares about the pets of its policyholders and not just their wallets, it is dedicated to helping you get the finest available treatment for your dog or cat. Our pets never live long enough, but at least we know with a Healthy Paws policy we’ll be able to give them the best possible life for the time they’re here.